Hidden in a not-so-quiet corner of Corvallis, Oregon, sits an old, perpetually freezing building with plain off-white walls and hardly any windows. Located at the very edge of Oregon State University’s campus, where busy students rush by on their way to and from classes, most pass by without any notice of this building. Yet, despite its humble appearance, one could argue that Wilkinson Hall marks its place on the map as the beating heart of OSU’s research program. Wilkinson Hall is home to the College of Earth, Ocean, and Atmospheric Sciences (CEOAS) at OSU. Yearly, CEOAS receives the most research funding of any college at Oregon State, totalling $119,175,248 for the 2017-2018 school year, almost half of all the funding that OSU received that year. The college is using this money to take on many exciting and important research tasks with a birds eye view – literally. OSU is turning its attention to a rapidly growing area of study: geographic information systems (GIS). GIS technologies have, in the past two decades, become ubiquitous and offer virtually infinite possible applications. For example, the uses of GIS technology range from global positioning systems in a smartphone to launching satellites to capture images of the Earth from space. These satellites are known as remote sensors, gathering data without being controlled os used hands on. The data from these eyes in the sky are what Peder Nelson, senior faculty research assistant at OSU, tries to decipher so that himself and others can understand what is happening on Earth, and his track record is impressive. I met with Nelson in his office in Wilkinson Hall one perfectly cloudy autumn evening talk with him about his projects and research. He welcomed me into his small office with a smile, gesturing with a swing of his lanky arm for me to sit at the table across from him. We made ourselves as comfortable as we could in the clunky wooden chairs. After making space for myself among the countless NASA stickers he had on display, I asked how he knew he wanted to pursue an area as specific and technically challenging as remote sensing. Excitement sparkled in his face, and he could barely contain the pride in his eager blue eyes. “You can say I was born into the business,” Peder laughed as he told me of how his father was a main developer of the original Landsat satellite in the early 1970s. Despite his legacy status in the industry, his fate wasn’t clear from the start. Nelson’s unlikely path to remote sensing wound around eight Landsat satellites and an undergraduate degree in recreation to lead him to where he is now: a lead researcher for NASA at a prominent research university. Without any previous class work or job experience in the industry, Nelson first began working with GIS as a volunteer with the Bureau of Land Management, where he learned to use various software on the fly. Thanks to his perseverance and interest in the technology, his volunteer position turned into a job collectingsatellite burn severity data after the Biscuit Fire of 2002 in southern Oregon. From there, he went back to school to earn his masters from Southern Oregon University in biology with an emphasis in environmental education, and a minor in remote sensing, a novel idea at the time. Nelson noted that, then, the idea of GIS and satellites was lofty and information from these systems was limited to those in positions of power – researchers, university professors, governments, and the like. There weren’t even many university programs in the discipline. He credited the shift from private to public accessibility to Google. Before Google Earth, the only people who had access to images of our planet from space were people who could afford it. At $800 an image, acquiring satellite data for research was no simple task. Google Earth allowed easier access to that satellite imagery, and made it so people began to think more spatially about their lives. Being able to visualize where you are and make spatial connections to what’s around you has an amazing ability to change people’s perspectives. Since his unpredictable introduction to the discipline, he has significantly contributed to research involving land cover data derived from the Landsat satellites, such as interpreting and drawing conclusions about what types of changes have materialized since the Landsat program launched in 1972. 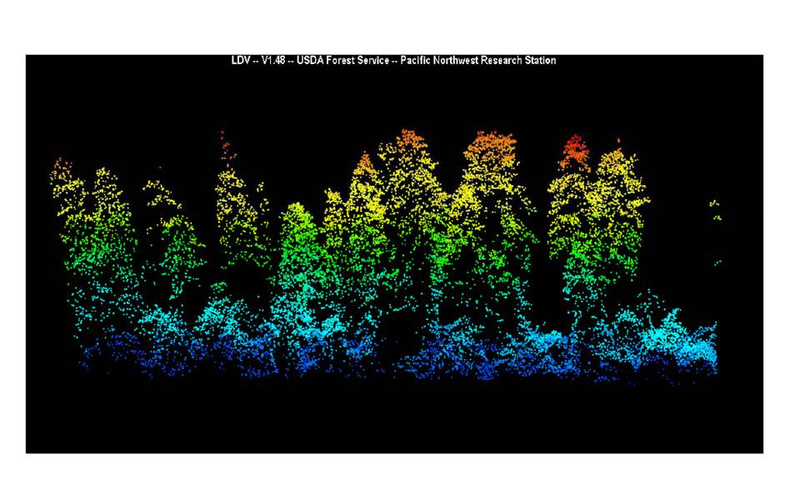 In addition, he worked with scientists flying LiDAR lasers over Oregon to collect elevation and land cover data. His work in that field was his ticket to OSU. He made contact with Robert Kennedy, director of research in the applications of remote sensing in ecology (LARSE), after presenting his work at a conference held by the university. From there, he secured a job as a researcher, unsurprisingly by chance. His flagship project at the LARSE lab of OSU was an assignment from NASA to create a land cover map of St. Petersburg, Russia. After marking his place at OSU as a skilled analyst and expert talker, he was granted more money to fund research to analyze time series maps of Landsat imagery to understand the the landscapes of several locations around the world. Despite his bird’s eye view of the world from the ivory tower of OSU’s research program, Nelson is an advocate for bringing remote sensing to the public so that more people can see the benefit of looking at the world they way he does – from space. That is his main goal through his work with the space agency’s GLOBE program (Global Observations to Benefit the Environment). Nelson has brought NASA to OSU again with his work developing an app for GLOBE. His current projects revolve around this app, Globe Observer, an enhanced method for people to participate in citizen science. Citizen involvement in remote sensing is key to ensuring the accuracy of data on the ground, and the ability of anyone to participate in imagery analysis has become crucial. And now, thanks to the leaps and bounds technology has made in the last ten years, it’s easier than ever for the public to gather data. With Globe Observer, anyone with a smartphone can see their world through the lens of an imagery analyst, while helping professionals glean higher quality results. “It’s really neat actually – a lot of the satellite data we get, they’re images taken from space so there’s a lot of atmosphere in the way. Getting around the clouds and fog and all of that is really difficult.” He laughingly nodded his head to the window, where we could see a thick layer of clouds obscuring any sunlight trying to break through. Because of Globe Observer, people from all over the world can take pictures on the ground, one in each of the four cardinal directions, and of the sky to record land and cloud cover data. This helps analysts working with Landsat and other satellite imagery ground truth their data – a way of fact checking their interpretations – as well as help them determine what ground conditions may lurk under those pesky clouds. Nelson continues to work on the Globe Observer app, with funding from NASA and a drive to help people understand the ways in which they can better the planet. For example, the newest addition to the GLOBE program, Mosquito Mapper,allows people to upload data about the types of mosquitoes in an area. The information people provide on the app can be accessed by public health and government officials to understand the range of mosquito species that act as vectors of disease. As a top tier NASA researcher, it comes as a surprise to many that Nelson has chosen to stay at Oregon State after 12 years, even to himself. “I really still don’t understand quite how I got here.” Nelson paused to look out the window for a moment of reflection. His lips turned up slightly and he shook his head slightly before turning back to me. “The projects. That’s really it.” Nelson continued, lurching forward with renewed excitement as he explained the different projects he’s worked on at OSU, which have offered him experiences he perhaps wouldn’t have gotten anywhere else. At OSU, he also discovered his love for teaching. Being able to give his students the ability to use satellite imagery and GIS technology, and the skills to apply it to various disciplines has become the real reason he’s stayed at the university. Not to mention, it allows him to practice his favorite hobby. The sky outside had darkened, heavy rain thumped against one of the rare Wilkinson windows, and my fingers were stiff from cold and from frantically recording Nelson’s rapid, passionate speech – with limited success. Even after the impressive accomplishments he’s achieved and the high level connections he’s made around the world through his research, Nelson remains humble, and appalled at how far he’s come – and he’s not done yet. As he looks for new projects to start up while at OSU, Nelson will continue to work with NASA on the Globe Observer app, exploring the ways that the app can be better utilized by the public. The newest installation, Mosquito Mapper is now live on the app, which is free on the app store for Apple and Android phones.